The Admiral's Log - What Happened to Our Stocks of Flounder in Galveston Bay? The Admiral’s Log – What Happened to Our Stocks of Flounder in Galveston Bay? The title to this article leads one to believe that we will be discussing a big drop in the population of flounder in the Galveston Bay Complex. If this were prior to 2009, that would have been the case; however, today flounder are flourishing and stocks have increased dramatically. Up until January 2009, flounder in Texas were under very liberal bag limits. Surveys by the Texas Parks and Wildlife Department showed a progressive decline in numbers and quality of flounder. Something had to be done to save the popular sports fish. Efforts were already getting started to replenish the stocks even before the TPWD took action. Sea Center Texas was embarking on a flounder hatching and restocking program that many anglers thought would never work. Finally, with mixed support and opposition from flounder fishermen, a new set of regulations was enacted. The most drastic measure was to curb flounder fishing during November, the prime month for the annual flounder run or migration to the Gulf of Mexico for the winter. Polly Kent with her own healthy November limit. At first, the TPWD looked at closing the fishery all together during November; however, they relented to the pressures of sportsmen to allow a two-fish per person limit that month while prohibiting flounder gigging all together in November. 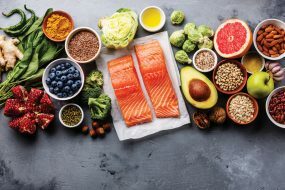 Other changes included the reduction in the bag limit from 10 fish per day to five during all other months and elimination of the two-day possession limit. While a large number of anglers opposed either part or all of the changes, another group while supporting the new regulations set out to work on restocking. 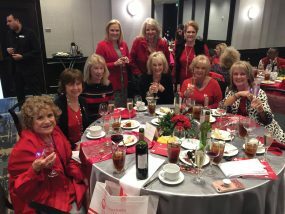 Two of the many local names that contributed to restocking efforts are Chester Moore, a well-known outdoor writer, and Bryan Treadway, an avid angler, who focuses on the Chocolate Bay Area where flounder had once been abundant. Those guys along with others and with the support of the TPWD and CCA-Texas worked with Sea Center Texas in Lake Jackson to start a flounder hatchery. 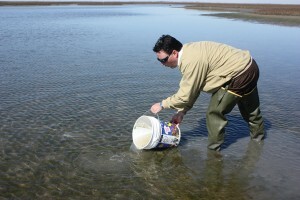 The first batch of fingerling flatfish was introduced into the Galveston Bay Complex in West Bay. Annual stockings followed and, with all of the efforts combined, things soon began to change. 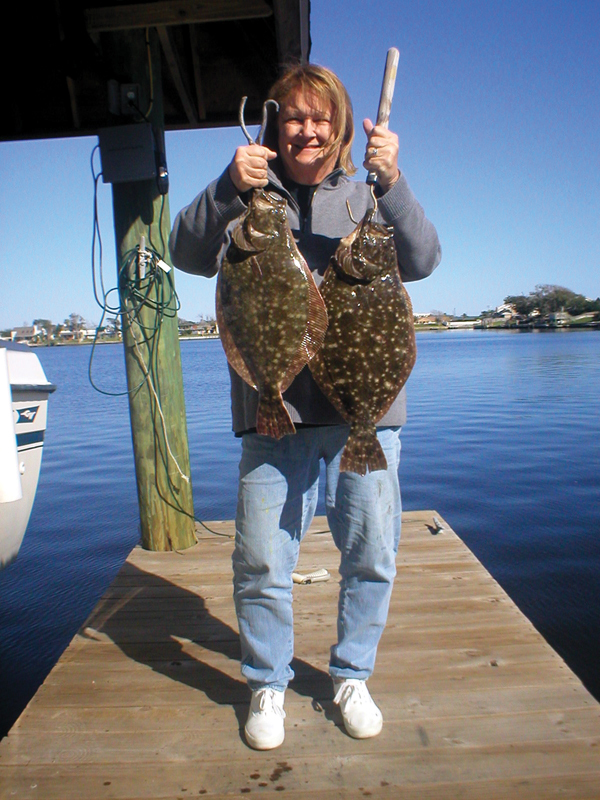 Flounder have withstood enormous pressure due to being a top choice for tablefare. Earlier, we called flounder sports fish and not game fish. Since they continue to be harvested commercially, they cannot be designated as a game fish. During the 1990’s and first decade of the 21st Century, the stocks were showing significant decline. Once the efforts to save the stocks began taking effect, things changed rapidly. The most recent survey of flounder shows that during 2011-12 the catches of flounder increased 149 percent over the prior years controlled by the old regulations. That statistic is even more amazing considering that the fishing effort in Galveston Bay declined during the same period. Ask most fishing guides and they will tell you that they are seeing and catching more flounder lately. 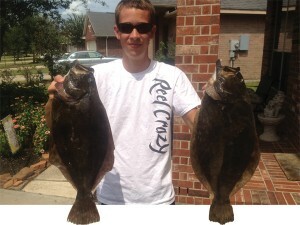 Nevin Pinter with a pair of 24” flounder caught from a kayak in Kemah on Chicken Boy lures. Today, anglers fishing the hot spots, mainly around the passages to the Gulf of Mexico, during November are taking easy two-fish limits of quality flounder. Prior to 2009, a lot of fishermen would leave with empty stringers. While it appears that the efforts to save the flounder are working well, similar attention needs to be directed to another popular sports fish, the golden croaker. While croaker still exist in good numbers around our area, the quality is way down. The fall croaker run has been almost non existent in recent times. Years ago, during October and November, a run of large croaker in the two pound and larger range would occur at about the same time as the flounder run. Today, a few large or bull croaker are caught; however, it is nothing like two to three decades ago. Let’s enjoy this year’s flounder run and we will address golden croaker in a future article.